A stacked dado blade set is one of those accessories that every table saw owner should have in their tool inventory. For me, there's hardly a better way to cut precision dados, grooves and rabbets. Unfortunately, stacked dado sets don't always come with clear instructions on how to set them up properly. This can lead to a lot of confusion for someone who has never used one. 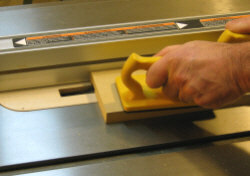 And, if it's set up incorrectly, could result in damage to the dado cutter  or worse, an accident. In this article, I'll show how I set up my dado blades to create a perfect match of the dado groove and the board that will fit in it. The steps will include setting up the stack, measuring and shimming, and making test cuts to verify the width and depth. 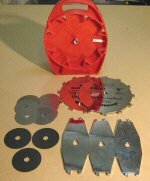 Most dado saw blades come with two outside blades, a set of chippers and an assortment of shims. The outside blades will form the shoulders of the dado cut, while the chippers job is to chisel out the center and create a flat bottom in the groove. 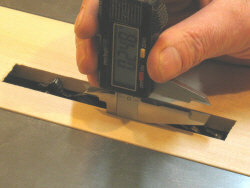 The shims allow you to fine tune the width of your dado set-up. I'll be using the Freud 8" SD208 pro dado set for this article, to illustrate how I make my set-ups. This is an excellent stacked dado blade set for the price and is available from Amazon and other quality retailers. 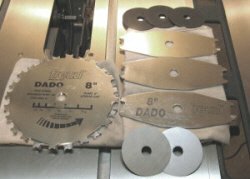 Instead of the usual five chippers, this dado blade set uses three chippers and three 1/16" spacers, but the set-up follows the same procedures as other stacked dado sets. It only takes a small bit of wood dust or other debris to throw your set-up out of kilter. 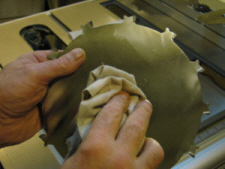 It's also one of the main reasons for vibration which often produces rough cuts. To ensure that the blades and chippers run true, the table saw's arbor must be clean and free of any material that could get caught between the arbor washer and blade face. After wiping with a rag, I like to run my thumb around the washer to get a feel for how clean it is. This is also an excellent way to check for any nicks on the washer as well, just be careful of any sharp edges. Both sides of every blade, chipper, spacer and shim must also be cleaned before they can be installed. Wiping with a clean, lint free rag and using a little wd40 usually does the trick. The wd40 will also help keep unplated blades and chippers from rusting while stored, an added bonus. For the purpose of this article, I'll set the dado blade stack width to fit a piece of 3/4" mdf into a groove cut in another piece of the same material. The first thing we need to do is determine the exact thickness of the piece that will fit in the groove. 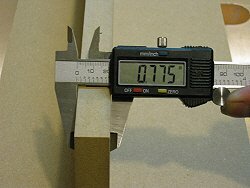 As you can see from this photo, 3/4" mdf is not always 3/4". To get an accurate reading of the material width, I recommend using a set of calipers  either dial or digital calipers will work fine. 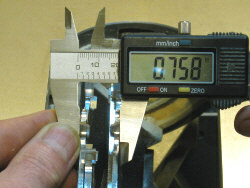 The calipers will also be used later on to measure the width of the dado blade stack. 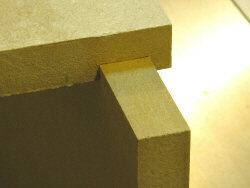 The photo on the left shows the actual thickness of this mdf material which is sold as 3/4". As you can see, it's exactly 25 thousandths over the nominal thickness. This is pretty common these days with all the imported sheet products available at local building supply stores, so make sure you measure to get an exact reading. With this measurement in hand, we'll set up the dado stack as close as we can to this figure. Always follow good safety protocol when changing blades on the table saw, or for that matter, any kind of machine that has the potential of removing body parts we'd all like to keep. Make sure you pull the plug from the wall. The two outside blades that come with most stacked dado sets have beveled teeth alternating with flat topped teeth. The beveled teeth will form the shoulder of the dado, slicing cleanly across the grain of the wood, or in this case, the mdf. The flat topped teeth will square out the bottom corners of the dado. 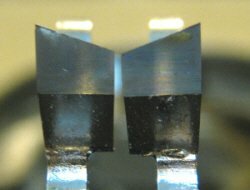 This close-up shows the proper orientation of the beveled teeth on the two outside blades. It's important that the bevels are running down towards the inside of the stack like in the photo on the right. If they're put on backwards, the corners of the dado won't be cut. To get close to a 3/4" stack width, I'll need both 1/8" outer blades, three 1/8" chippers and two 1/16" spacers. I'll also add a .020" shim because the mdf is .025" wider than 3/4". This should get us fairly close to the target. We'll start by installing the left outer blade against the arbor washer. The .020" shim will go on next, followed by one of the chippers. The chipper's teeth should sit between two teeth of the outside blade and not be touching them. The teeth are wide enough that they overlap one another, so be sure there's no contact between any of the blades. 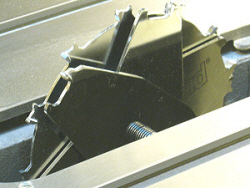 The chippers must be staggered to prevent teeth contacting one another. Add a 1/16" spacer and then another chipper, followed by another spacer and chipper. Stagger the chippers so that they are an equal distance apart. This will help balance the stack and prevent any vibration from too much weight on one side. Now the right outer blade can go on. I try to line up the beveled teeth side by side so that it's easier to get an accurate measurement with the calipers after it's all together. Tighten the nut finger tight at this point and rotate the blade by hand to verify that there's no contact between the teeth. Once everything looks good, tighten the dado stack firmly with your arbor wrenches. It's not always possible to use the outside blade washer with the nut when stacking dado blades this wide. If there's not enough room to turn the nut on to the end of it's threads, leave the washer off. 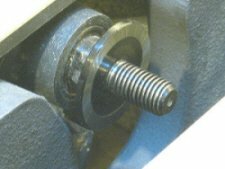 It is not neccessary to have an outside washer on a dado blade set-up, but you must make sure the nut is on fully. Measure across the tips of the outside blades to get the width of the stack. Now take the calipers and measure across the dado head at two of the beveled teeth that you lined up earlier. I like to measure at the top points of the teeth to get the most accurate measurement. This measurement will show how much the dado blades need to be shimmed to equal the width of the workpiece we measured earlier. According to this measurement, I still need to add .017" to the stack. The shims that came with the dado set include .004", .008", .012" and .020" thicknesses. I'll use a .012" and a .004", which should be close enough for a snug fit. I have found that if I set my dado stack a couple of thousandths below what I need, I get a perfect fit. This is no doubt due to the fact that my fence is set slightly wider from the blade at the back than the front. The effect is to cut a slightly wider dado than what is measured at the blade. Once you know this amount, it's easy enough to factor in when making your set-ups. The fence is set this way to avoid pinching the wood between the back of the blade and the fence when ripping smaller stock. The rear of the blade can lift the stock and throw it back at you. This is what is known as kickback. I removed the outside dado blade and a chipper and installed one shim on each side of the chipper, then retightened the stack. A quick measurement showed I was at .773", close enough for a test cut. Shims allow you to fine tune the width of the dado cutter so you can get as close as possible to the size you need, usually within a few thousandths. They can also present a few problems. A couple of drops of light oil will help the shim stick to the side of the blade. Because they are so thin, they tend to fall into the threads of the saw's arbor and prevent the stack from closing properly when tightened. To prevent this, I add a couple of drops of light machine oil or wd40 to one side of the shim and then center it on the blade. 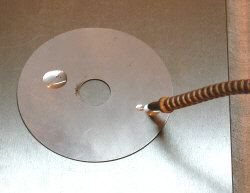 The surface tension keeps the shim from falling into the threads of the arbor. Even though there is quite a bit of overlap between the teeth of the chippers and blades, stacking too many shims in one place can push the teeth far enough apart to leave an area of your workpiece uncut. When using a lot of shims, it's best to distribute them evenly between the dado blades. Like most other set-ups in woodworking, it's important to make a test cut in a scrap piece of the same material before you start carving up your good workpieces. Using the calipers to set the initial height of the dado stack. After I installed my zero clearance table saw insert that I use for 3/4" dados, I set the height of the dado cutter just slightly under 1/4". I just measured with my calipers from the dado insert to the top of a tooth at top dead center using the step measurement on the caliper. I just want to get in the ball park, I'll sneak up closer to the exact height after my first test cut. Sometimes it takes two or three adjustments, depending on how exact you want to be. Once the dado blade is locked down, it's time to take a test cut in a scrap piece of mdf to see where we're at. Make sure you use push pads or a featherboard and push stick to run the stock through the blade. Running a piece of scrap mdf through the dado blade to check for fit. Using just your hands is stupid and downright dangerous with that many razor sharp teeth spinning at 5000 rpm half an inch underneath. The farther your hands are away from the blade, the better. To check the width of the dado, test the fit on your workpiece. You should be able to push it on with a bit of resistance. Having to pound it on is too tight and will leave no room for glue. Too loose is no good either, you lose a great deal of the strength of the dado joint when there's no solid contact between the shoulders of the dado and the part that fits in it. If the fit isn't good, add or remove shims to adjust the width and make another test cut. The depth can be measured with the calipers and also adjusted accordingly. Check the fit by testing it on your workpiece. It should be a snug fit. The width on the cut I made above turned out perfect and I only had to adjust the height of the dado blade up a small amount to get my 1/4" depth on the dado. The more you work with your dado blade set and get used to it, the easier these set-ups become. Like I mentioned earlier, if I set my stack width a couple of thousandths short of my mark it will almost always give me a perfect fit. You only get to know these things by experience. The more you use your dado cutter, and the more familiar you get with your table saw, the faster and more precise your work becomes. Cut perfect rabbets with a shop made sacrificial fence. Make accurate measurements with digital calipers. Mdf and particle board create a lot of dust when cut with a dado blade. God only knows what kind of toxic substances are used in the binders of these man-made materials. Protect your lungs with a good face mask even if you have a top notch dust collection system.